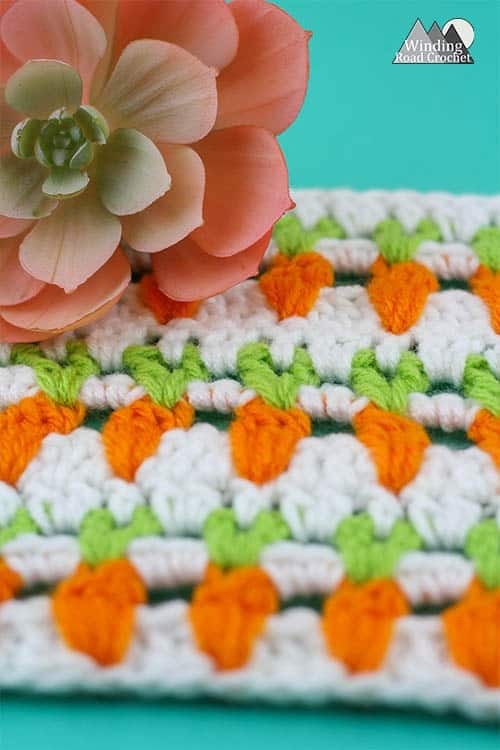 A little while ago I saw a beautiful example of the Moroccan tile stitch in the white, orange and green and it inspired this carrot stitch. I took a few existing stitches, made a few tweaks and came out with this beautiful garden inspired carrot crochet stitch. To get the perfect carrot shape I needed to combine two stitches, the cluster stitch and the spike stitch. Instructions are provided below for the Cluster Spike stitch as well as a left and right handed video tutorial to walk you through this stitch pattern. Check out all my Free Crochet Patterns and some perfectly Spring Pattern Pictured below! Spike Cluster Stitch – Instructions below. When I originally designed this stitch, I was using a simple cluster stitch for the base of the carrot, but this gave me a plump short carrot instead of a long pointed carrot. I decided to mix the spike stitch with a cluster stitch to get the carrot shape I was looking for. Here is how you do this stitch. Check out the video tutorial below for a visual aid. Spike Cluster Stitch – *Yarn Over, Insert you hook into the base of the next stitch (where the stitch attaches to the stitch of the previous row), Yarn Over and pull up a loop, Yarn Over, Pull the first loop on your hook through the second and third loops on the hook,* repeat from *to* a total of three times. You will end up with 4 loops remaining on your hook. Yarn over and pull the first loop through the remaining loops on your hook. This completes the Spike Cluster stitch. The Spike Cluster Stitch will always be followed by a Chain to secure the stitch. The Carrot stitch starts with a Chain that is a multiple of 3+4. R2: Ch2, Dc in each St across. (14) Change to Orange in the last stitch. R3: Ch2, turn, Dc in the first St, Ch1, Skst, Spike Cluster Stitch, *Ch2, Skip 2 Sts, Spike Cluster Stitch,* repeat from *to* a total of 3 times, Ch1, Skst, Dc in the last St. Change to White. R4: Ch1, turn, work 2 Sc in the next Ch space, *Skst, work 3 Sc in the Ch Space* repeat from *to* a total of 3 times, Skst, work 2 Sc in the last Ch Space. NOTE: In Row 4 you are skipping all Spike Cluster Stitches. R5: Ch2, turn, Dc in the first St, *(Dc, Ch, Dc) in the next Cluster St from row 3* repeat from *to* a total of 4 times. Dc in last St. NOTE: In row 5 you are skipping most of the Sc and only working in the first stitch, all Spike Cluster Stitches from Row 3 and the last Stitch. R6: Ch2, turn, Dc in the first St, Dc in-between the Dc Sts, *Dc in Ch Space, Work 2 Dc in-between the next Dc Sts* repeat from *to* a total of 3 times, Dc in the last Ch Space, Dc in-between the next Dc Sts, Sc in the last St.
To continue this stitch, simply repeat Rows 2-6 as many times as you like. Written pattern, tutorials, graphs and pdfs of the Carrot Crochet Stitch Tutorial are copyright Windingroadcrochet.com. Please do not reprint or repost this content as your own, but please feel free to share this link with others. You can find more information on sharing my work with others in the Terms and Conditions Page. so….I am sitting with my yarn on the table ,and let’s go ! I just love this stitch!